When I started weaving, 40 years ago, I did not belong to a guild. In fact, I’d been weaving for nearly eight years before I even knew there was such a thing as a weaving guild. 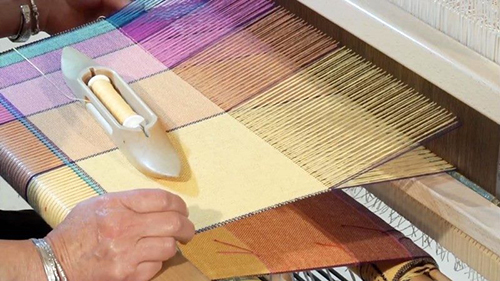 It was when I moved to beautiful Salt Spring Island after art school that I discovered the joy of the weaving guild. I was swooped up by my local guild: a wonderful group of warm and caring women. These women supported me as I navigated so many things that were new to me at the time–especially being a new mother and the loneliness of not having family close by. I started my teaching career at that guild and I remember that period as a lovely time of sharing, weaving, a lot of love, and a lot of laughter. 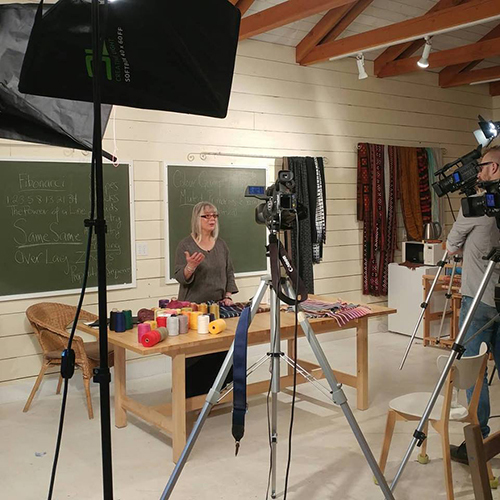 For many years, as my teaching schedule became more and more demanding, I travelled all over both Canada and the US teaching what were almost always weekend workshops. I loved those weekends–but I always felt like we were all just getting started when it was suddenly time to leave. Sometimes, I felt sad and maybe even a bit cheated that we could only scratch the surface over a weekend. After years of this I saw I wanted to do it differently. I committed to making my home studio a fully functional workshop space, so that I could offer retreats that could extend a full five days. I saw so clearly how much further we’d be able to journey in those five days, especially if everyone had access to floor looms. Those first workshops, I had no idea if anyone would sign up. I had that voice in my head—you know the one. (“All the way to Salt Spring Island? For a weaving retreat?”). I just had to hope it was true what they say (“If you build it they will come”) and I had to trust that, somehow, weavers would show up. Show up they did. We sold out every offering within hours of posting, and our weavers came from all over the continent. I was completely blown away. For the past 10 years, that’s been my mode of teaching. A workshop every three weeks, like clockwork, for all those years. It’s been great. Fast-forward to the fall of 2016. The workshop wait lists had been getting longer and longer. I started to see that I was never ever going to be able to accommodate all the weavers who wanted to attend my workshops. So I started to consider the possibilities. I had made a few videos for Louet many years before and I had heard from hundreds of Louet’s customers over the years how much they had enjoyed them and how much they had learned from them. So, then—what’s the next step? Videos for workshops? My retreat students and I tossed around lots of thoughts and ideas and slowly I found the courage to attempt it. I still had that voice in my head—you know the one. (“An online weaving guild? Really? ?”) But as always, I would never know unless I gave it a try. I really didn’t know where to start but one of my students, Ellen, is an experienced marketer. Ellen helped me collect all my thoughts and ideas on a storyboard–and suddenly, it all just fell into place and I saw what I would do. 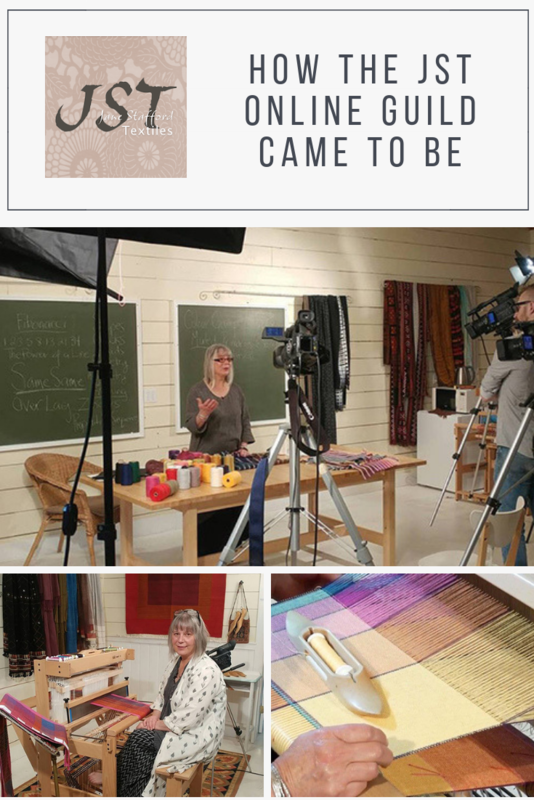 I would start at the beginning—the same way I do in my live workshops–so that all weavers could come along on the journey. Then–the same way I do in my live workshops–I’d take my online students through the possibilities of various weave structures. I hired a local film crew who make videos in the community and we booked our first five-day session, just to see what we could do together. It was a blast! In our first week we captured enough footage to make three episodes. We learned a ton together and have now made over 30 videos together. And here we are. It’s now official: JST’s Online Guild is a going concern with members on every continent. (Well, except Antarctica. What’s with those penguins anyway? Or could it be a shortage of string?) And so, I would like to thank you for your support in this exciting adventure, and invite you to come join the party.